Officials investigating the failed launch of a Russian Soyuz spacecraft said Friday they had identified part of the reason for the accident. The rocket lifted off from the Baikonur space center in Kazakhstan early Thursday on what was scheduled to be a six-hour flight to the International Space Station. But roughly two minutes into the flight a booster rocket failed. 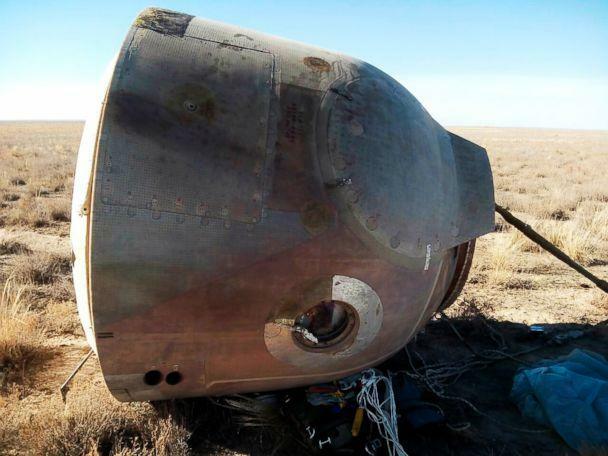 The launch was aborted and the two-man crew, Russian cosmonaut Alexey Ovchinin and NASA astronaut, Nick Hague, were blasted free of the rocket inside their capsule and hurtled back to Earth, falling from almost 40 miles. 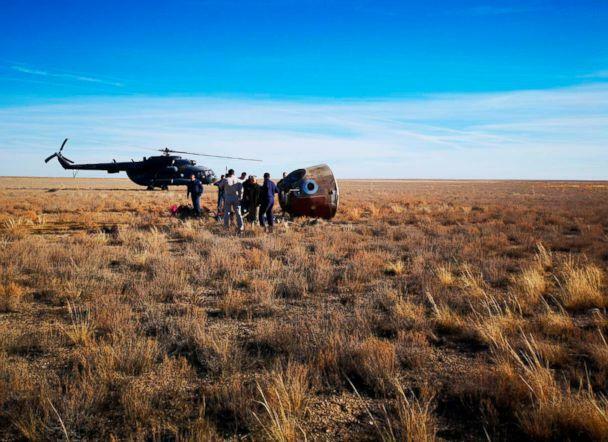 The capsule’s parachutes deployed and they landed in central Kazakhstan safely, where rescue teams recovered them. On Friday, the executive director of Russia’s space agency, Roscomos, said the immediate cause of the booster failure was “clear.” Sergei Krikalev told reporters that part of the first stage of the rocket had struck the second stage after separating, damaging the booster. “There was a collision with one of the side sections, which is part of the first stage. During the separation, the first and second stages came into contact,” Krikalev told reporters. But they said they needed more time to establish what exactly had caused the rocket to fail. It was not clear why the two stages had collided, Krikalev said, saying it was possible the rocket had changed trajectory slightly. That means it could have moved into the path of the falling first stage. 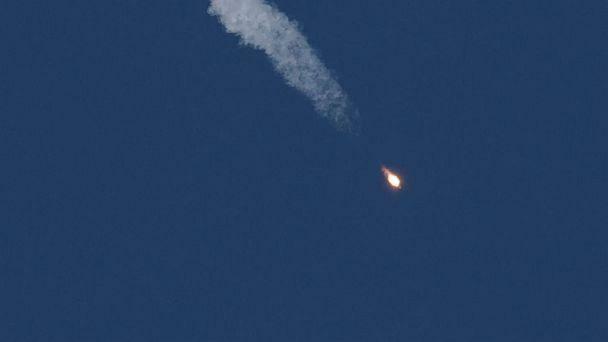 It was also possible that the first stage parts had failed to separate properly, he said. He said one version was that the first stage had not separated correctly. Investigators needed a lot more information before they could provide a detailed cause, such as whether a part had malfunctioned, Krikalev added. Russia has said it will suspend all its manned flights to the International Space Station until the cause of the accident has been investigated. A state commission has been established to investigate the incident. Krikalev said it would present its first findings around October 20, and before the end of the month. The accident throws off the launch schedule for the ISS, as Russia’s Soyuz is the only route up to the station for astronauts. There are currently three astronauts aboard the ISS: Alexander Gerst of the European Space Agency; Serena Auñón-Chancellor of NASA; and Sergey Prokopyev of Russia. But the delay represents no danger to them, experts have said. The station is currently stocked with sufficient supplies for six months and can be re-supplied by unmanned cargo ships. Krikalev said the launch of the next supply craft, a Russian Progress rocket, may be delayed. Roscomos would try to speed up the launch of the next Soyuz, but the crew already aboard the ISS had been planned to remain there working with Hague and Ovchinin, Krikalev added. Hague and Ovchinin have now returned to Moscow to the Russian space center, known as Star City. 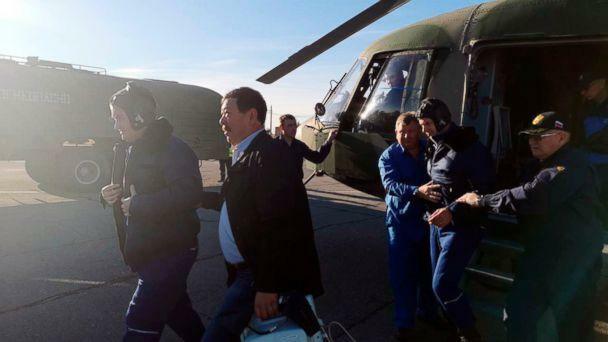 Photos released by Roscomos showed them walking down a staircase from a Roscosmos plane. Medical staff overseeing them said the two would not need to spend more than two days in the hospital for checks. “The guys will definitely fly. We are planning their flight for the spring next year,” Rogozin wrote, posting a photograph of himself with his arms around the two men aboard a plane. The accident is the first failed launch of a manned mission to the ISS and the first time a Russian rocket with a crew aboard has failed since 1983. Russia’s space industry, however, has been going through a troubled period, hit by corruption cases and problems with its newer rockets, according to Yahoo! News. In 2016, Roscomos suspended launches of its Proton-M rockets after it had to return 70 engines to production lines over concerns about faulty parts. A Progress rocket was lost in the atmosphere in December 2016. Rogozin, who was brought in to oversee the transformation of Roscomos into a state company, in 2015 accused one of Russia’s main suppliers of launch systems of embezzling $128 million. Other failures have been blamed on corruption within the manufacturing process of the rockets. On Thursday, Russia’s Investigative Committee, the equivalent of the FBI, said it had opened a criminal probe to examine whether there had been any violations in the construction of the failed Soyuz rocket. The U.S. has been using Russian rockets to reach the ISS since the American space shuttle was retired seven years ago. NASA is planning to replace it with commercial partners, including SpaceX, but that remains in the works. SpaceX and Boeing are both due to hold their first test flights for the ISS route in December and January and hope to make their first NASA flights next summer.